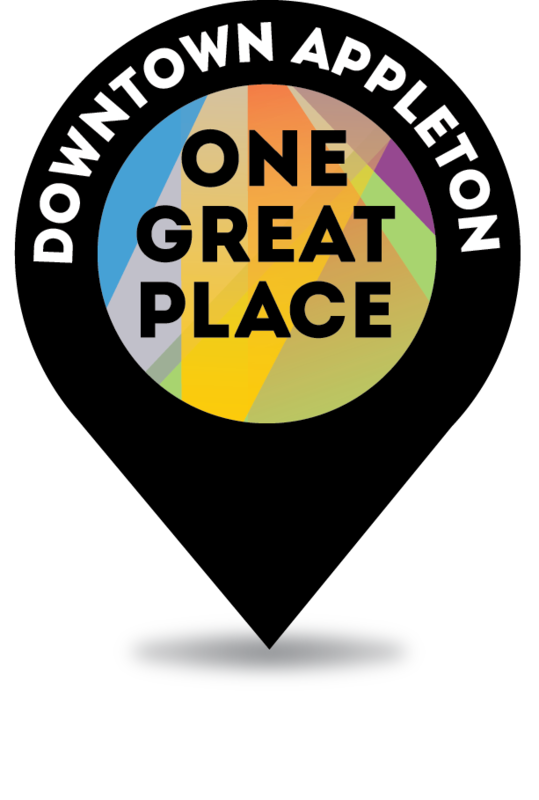 ADI Reveals New Brand – Downtown Appleton – One Great Place! ADI Reveals New Brand - Downtown Appleton - One Great Place! Posted on Mar 26, 2015 by Appleton Downtown Inc.
Appleton Downtown, Incorporated (ADI), today announced a major brand change – the first in more than five years – for Downtown Appleton, including a new promotional logo and slogan, specifically designed to reflect the Downtown’s evolving position as a destination in the State of Wisconsin – a destination that’s growing a firm economic foothold in the region with its “creative economy” philosophy that blends the arts, music, technology and culture together in a walkable mile-long space. Jennifer Stephany, ADI executive director, made the announcement and unveiled the new “Downtown Appleton – One Great Place!” logo and slogan to Downtown business owners, advocates, area residents and city officials as part of ADI’s annual Business Awards Celebration and launch event at the Radisson Paper Valley Hotel. “The new brand spells out and affirms what area residents and many visitors across the state have already come to know that Downtown Appleton is one great place for arts, culture and entertainment seekers with a year-round Farm Market, performances at the Fox Cities Performing Art Center, ongoing original music events, annual festivals and a full slate of summer activities that draw as many as a half-million attendees or more,” Stephany said. In addition to its many crowd-pleasing special events and activities, Downtown Appleton is also known for its 60-plus unique shops, more than 70 pubs and eateries and 19 museums, galleries and performance venues, as well as notable landmarks including Lawrence University and prominent special events such as Octoberfest, Mile of Music and the Downtown Appleton Christmas Parade. ADI is a non-profit advocacy source for businesses and merchants in Downtown Appleton. For information about upcoming Downtown Appleton events or ADI services, contact ADI at (920) 954-9112 or visit www.appletondowntown.org, on Facebook at the Appleton Downtown or Downtown Appleton Food & Fun Fan Pages, or on Twitter @downtowncool and @dwtnappleton.